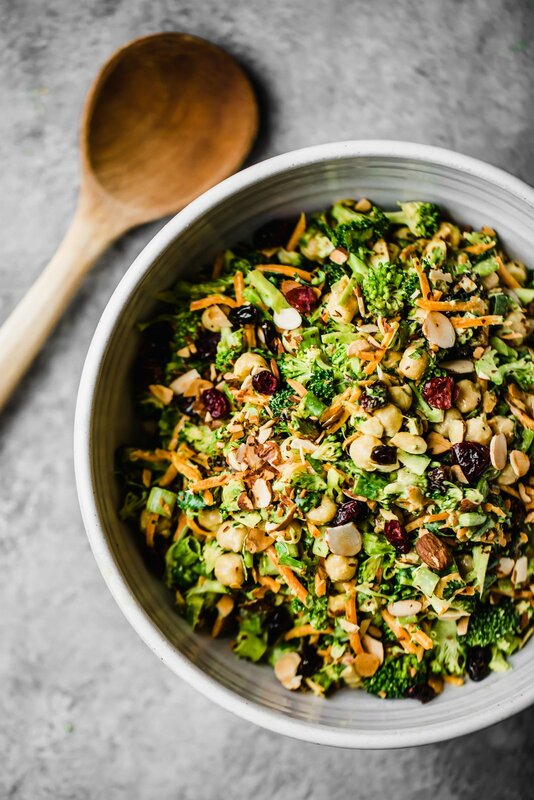 In a large bowl, add finely chopped broccoli, chickpeas, carrot, cranberries, green onion, and cilantro. Set aside. Make the dressing by whisking together the following ingredients in a small bowl: tahini, lemon juice, water, garlic, maple syrup, curry powder, ginger, turmeric, salt and pepper. Immediately drizzle over salad and toss to combine. Sprinkle almonds on top and toss a few more times. Serve immediately with fresh squeeze of lemon or place in the fridge for later. Salad will keep well up to 5 days.